Our streets are the worst of any major city in the United States: About two-thirds of L.A.’s thoroughfares are deteriorating. Angelenos spend more on car repairs due to damage caused by crumbling roads—a rattling $832 per year—than residents in other big metro areas. In 2013, Mayor Eric Garcetti pledged that twice a year a pothole repair truck would travel to every L.A. neighborhood; an additional eight to ten crews roam the streets daily to patch pavement. Here’s how. The Bureau of Street Services receives more than 200,000 pothole repair requests each year. Citizens typically alert the city by dialing the 311 hot line, using the My311LA app, or filling out a form on the BSS Web site. A Street Maintenance Division supervisor is sent to inspect the location to determine the extent of the problem. A dispatcher then schedules a two-person crew to make the repairs. Old streets are vulnerable to cracks. Water seeps through the asphalt, and under the continual force of traffic, gets into the supporting roadbed below. Eventually the bed erodes. With repeated impact from cars and trucks, the asphalt buckles and sinks, forming a crater. After clearing away debris and water, workers shape the rim into a rectangle with a shovel or jackhammer. As with a dentist drilling into a cavity, this widens the pothole at the top to better seal the asphalt. A long-handled brush is used to apply a sticky liquid known as SS-1H to the work area. The substance acts as a glue to affix new asphalt to the old. Workers wait roughly 15 to 20 minutes while the SS-1H “breaks,” that is, the water in it evaporates. Crushed rock, sand, and an oily binder make up the heated asphalt that is dumped into a pothole in progress. Workers smooth out the chunky aggregate with a rakelike tool called a lute, then let the stuff cool to around 200 degrees. 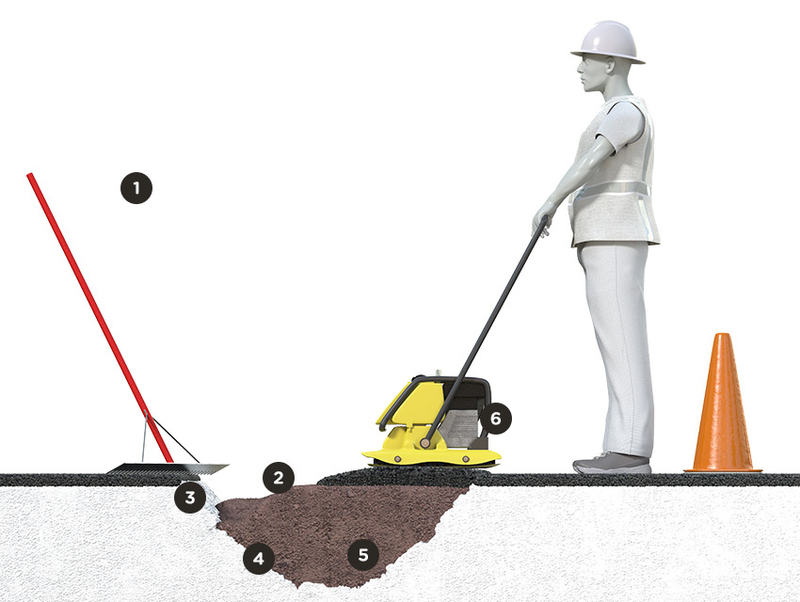 While the hot mix is still warm, workers run a vibratory plate compactor over the surface several times. Shaped like a lawn mower, it compresses new asphalt, ensuring that the material can support the weight of heavy vehicles. When repairs are completed, crews sometimes sprinkle extra aggregate dust on top to increase traction. Is There Any Hope for L.A.’s Terrible Streets and Sidewalks?